This unit offers 4 custom settings with elaborate control for each setting. Not to mention excellent video quality. This system is easy to set up and use. This system will tune audio automatically, so you will not hear any phasing. The advanced sound retriever technology is able to restore the minor sound details that were lost during compressing an audio file. Pandora, Spotify, TuneIn, and Bluetooth audio perform well. These APPs may not look pretty on this AVR. It sounds amazing, and almost as good as Hi-Res audio like FLAC. Even watching TV on this AVR is an engrossing audio experience. 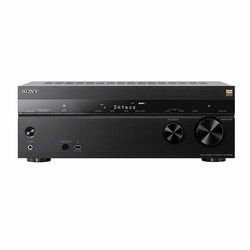 The receiver supports Ultra HD upscaling that turns 1080p into 4K. The device has Chromecast built-in as well, so you can control the audio via a Windows, iOS or Android device. Supports Dolby Atmos and DTS:X.
MCACC auto-tuning and full band phase control are able to provide you with crystal-clear sound. These two systems can reduce the phase lag. The operational power consumption is 310 W.
The total power output is 760 W, which is quite high, and it is enough for everyone to enjoy their favorite music tracks. Does not have an auto power-off function, so you should not forget turning it off manually. MCACC auto-tuning may be not enough and you may need to tweak it manually. The users menu a bit complex and you need time to get used to it. The device supports Alexa voice control, but the voice control device sold separately. 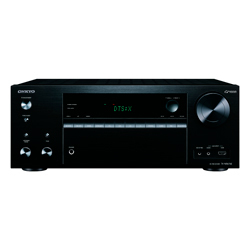 It is a 9.2 channel receiver with 125 W output per channel. 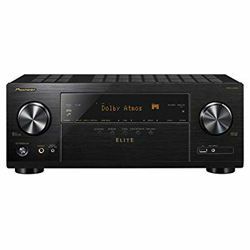 Decoding Dolby Atmos, DTS: X (up to 7.1.4 channels with an external 2-channel power amplifier) and Auro-3D - a full immersion in 3D surround sound with sound effects from above. AirPlay, Bluetooth, Internet Radio, Spotify Connect, TIDAL, Deezer and much more - access to virtually unlimited online music resources. Support DSD, FLAC, ALAC and WAV - High Definition streaming for Hi-Fi enthusiasts. It can stream music from different devices, such as PCs, laptops, smartphones and tablets. The total power output is 950 W. This is a huge amount of power. The processes of setting up and calibration are very easy. An HEOS application that lets you control the device (you can turn on and off different zones). Does not support the Apple lossless audio format. Does not support 4K HDR for Apple TV 4K. Sometimes it fails to recognize the input signal. The built-in decoders do not support Dolby digital plus. The comparison of Pioneer SC-LX701 vs Marantz SR7012 is not that challenging. The main advantage of Pioneer is that has great compatibility. Plus, it has many sound enhancement technologies, like MCACC. The main advantage of the Marantz is its total power output – it has 950 W versus Pioneer’s 760 W. Moreover, it can be controlled via voice. However, it has some disadvantages and the most important one is that it does not support Dolby digital plus. 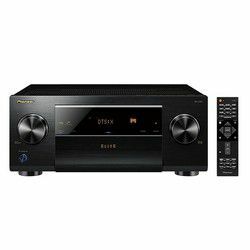 Besides, its operational power consumption is 710 W compare it with Pioneer’s 310 W.
If you choose between Marantz SR7012 vs Pioneer SC-LX701, then you need to pay attention to the power you need. 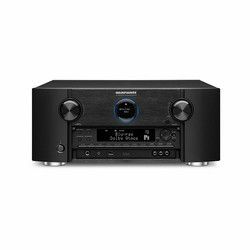 If you need something powerful, then Marantz is for you, but if you do not need that amount of power, and you need a great device with many additional features, then Pioneer is right for you.